Keep snow, mud, and other trail debris from sneaking into your nice dry boots with the Outdoor Research Women's Rocky Mountain High Gaiter. Thanks to the coated packcloth lower section and an elastic cuff, quick creek crossings, snowdrift postholing, and mudded out trails won't be a problem. 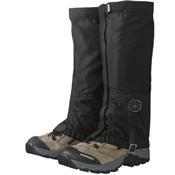 An underfoot strap and lace hook keep the gaiter secure, and a hook-and-loop front closure make for easy on and off.